Build-It-Solar Blog: Send in those project updates!! 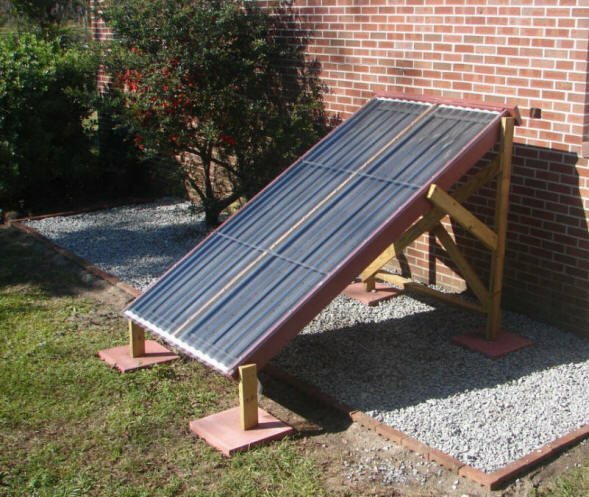 About a year ago, Lonnie sent in a description and pictures for his very nice and very simple thermosyphon solar water heating system. Its really nice and useful to hear how things are going after the system has been up and running for a while. If things have gone well with the project, its great for people who might want to build it to know that -- it makes it much more likely that others will do the same project. If things have not gone well, its important to know that as well so that others can avoid having the same problem. finally found a functioning comment box! I read your story about using cool basement air for house comfort, well i have opened the ceiling hatch to the attic, where we have continuous ridge ventilation, and i opene the door to the baement stairs, open a basement window on the shady side, and voila, we have natural cool air ventilation, never over 25 C when outdoors is in the thirties! I also have a few finned tube old heating coils hanging in the attic space to scavenge some heat to put in the solar preheat waterbarrels that keep it at 30degrees C, it's a help until i get my real collectors built!